With Pulborough going through to the finals this was a bit of a dead rubber but both teams went out and put everything into the game in every deteriorating weather conditions. Darts now had all their bench on the field with Poppy coming on for the impressive Megan, Millie on at No 8 and Evie T on for her debut in the team. Darts were on the front foot from the start and again it was the combination of forward and back play which was causing Cobham some problems. Millie was impressive at No 8 taking the ball on very strongly and making ground every time she had the ball. The pattern in the backs was again the same with Ewa attacking strongly with the ball and then acting as the provider giving Lizzie and Anna time to take the ball on. Evie T was in the game quickly and showed her courage clearing up loose ball despite being surrounded by the opposition. Holly again was attacking strongly from full back and Evie V was linking really well with her. Again it was Lara and Lola who were leading from the front and the go forward ball they provided allowed Karis, Ramat and Georgia to take the ball on at second phase in space. Tierney who has been improving throughout the season was again running strongly with the ball and it was the quality at ruck time that kept Darts firmly in the Cobham half. It was the excellent Cobham defence that was keeping Darts off the scoresheet and when they had the ball they had some strong and quick runners which tested the Darts defence but the line held firm. The pattern was the same in the second half and despite some good runs from Izzy and driving play from Ewa the scoresheet remained blank. The forwards toojk the ball on strongly for many phases and eventually it was Millie using her strength and power to drive towards the line and stretch out for the score that gave Darts the lead. With only minutes to go Cobham through everything at Darts and forced play deep into the half and after a series or penalties being conceded Cobham scored a great try in the corner. Just to keep the nerves on edge the conversion which was initially missed had to be retaken. This fortunately for Darts was also missed to end the game as a draw. 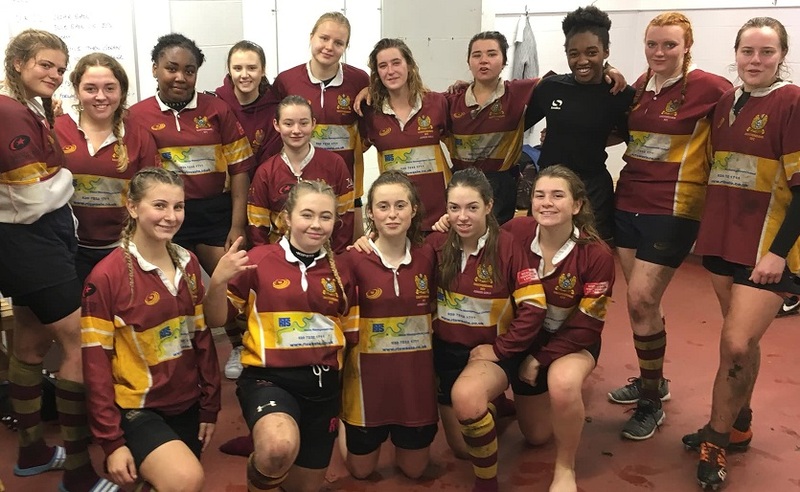 Another good game of rugby and everyone went home pleased with their performances which shows how far Girls rugby has progressed in a short period of time. Another difficult decision for player of the match but following a spell out of the game it was Millie who came away with the award.